Dodge Dakota Pros and Cons | Page 1 of 1 | Why Not This Car? What drives people to buy (or not buy) a certain car? TrueDelta's members share Dodge Dakota pros and cons based on their real-world driving experiences. It's a truck. Good at dragging stuff around. Bad at commuting. 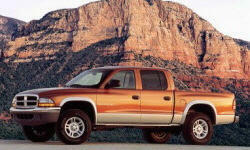 The 2005 and up were a new take on the baby-Ram look, with crisper edges than the predecessor. Dakota had V8 options up to 260 HP for this year, available 6-speed manual or 5-speed automatic. Cheap, cramped and very uncomfortable. Overpriced comes right to my mind when people say Dakota. For the price of a Dakota, you might as well get a full size truck. Comparted to others I know, my Dakota has had better than average reliability. This has been an exception strong and solid truck, with an exceptional engine and transmission. I like the way the Dakota seats allow you to see over the hood of the truck. The gauges and climate control knobs are all within easy sight and reach. Highest cargo and towing capacity in class. Largest bed in class. I do not want a full-size truck but still need the ability to tow and haul larger items. I`ve owned 3 in the past and have yet to be let down ?